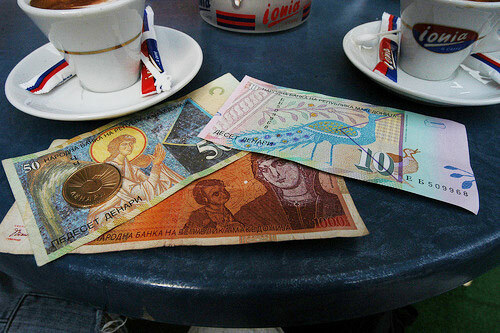 The currency of the FYROM is the Macedonian denar (MKD). Macedonian denar (MKD) notes come in denominations of 10, 50, 100, 500, 1000 and 5000, and there are coins of one, two, five, ten and fifty denar. The costs of living are significantly lower than in many European countries. However, when put into the context of the average monthly salary, the costs of living for the FYROM’s people are pretty high. Macedonian denar (MKD) notes come in denominations of 10, 50, 100, 500, 1000 and 5000, and there are coins of one, two, five, ten and fifty denar. You can only convert the denar inside the FYROM. Restaurants, hotels and some shops will accept payment in Euros (usually) and US dollars (sometimes). ATMs can be found in all of the major towns and tourist centres but not in isolated and remote places. Travellers cheques are difficult to change so do not rely on them, except as a form of emergency back-up money. Credit cards are widely accepted, but do not rely on this, even at a hotel or restaurant. Visa and Master card are the most popular cards. Economic policy and financial stability are the responsibility of the National Bank. The banking system in the FYROM is highly fragmented and is based on Banking Law and the National Bank Law. It is constituted from eighteen banks and eleven savings banks. 71.3% of the banking capital belongs to foreign investors. Fourteen of them are owned by foreign shareholders, of which four are owned by foreign banks (September 30th 2008). The Ministry of Finance is the authorized institution for issuing and revoking licenses for performing financial leasing. There are eight leasing companies that perform financial leasing and around 90% of their capital is owned by foreign investors (December 31st 2008). Payments are made in cash, with cash cards or credit cards. The national currency as mentioned above is the denar (ден). Usually the student must pay and organise their travel to the FYROM and to the company themselves.